Middlesbrough missed the chance to go top of the Championship as they were held to a goalless draw by Leeds United at Elland Road. Before kick-off Leeds fans projected images on to one of the stands urging chairman Massimo Cellino to quit. And there was little to cheer during the game as Leeds' best chance saw Souleymane Doukara's header saved. Boro's Jordan Rhodes missed when clean through, before team-mate Ben Gibson saw red for two yellow cards late on. Rhodes, a £9m signing from Blackburn, was handed his first start by Aitor Karanka, but shot straight at Marco Silvestri first time when he perhaps should have taken an extra touch midway through the second half. The Scotland striker, who had scored five goals in his past four appearances against the Whites, had a first-half header ruled out after the ball was deemed to go out of play before Ritchie De Laet put in the cross and also nodded wide late on. All of the focus before the match was once again off the pitch as home supporters urged Cellino to sell his 75% share in the club. Several images lit up the East Stand including 'Time to go Massimo' and 'Billy [Bremner] wouldn't accept this… so why should we? Sell the club' and remained on show during the match. Cellino agreed in principle to sell his majority share to supporters' group Leeds Fans United at the end of last October, but changed his mind a week later. Numerous protests against the Italian businessman have taken place since. Middlesbrough are now without a win in five games and remain one point behind leaders Hull in second, while Leeds stay 16th. Leeds manager Steve Evans said: "It's not my job to get involved with supporters. "I think supporters are quite rightfully the lifeblood of every club. I am a Glasgow Celtic supporter and Glasgow Celtic supporters are the lifeblood of that club. "Leeds United supporters are long here before any owner arrives or head coach, manager, player, and they will be here for a long time after. "But our supporters want to see performances on the pitch. That's what disappoints them more than anything." 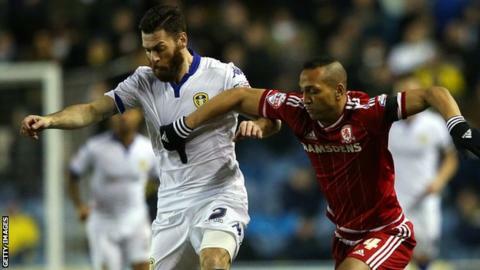 Match ends, Leeds United 0, Middlesbrough 0. Second Half ends, Leeds United 0, Middlesbrough 0. Corner, Leeds United. Conceded by Tomas Kalas. Attempt missed. Luke Murphy (Leeds United) right footed shot from outside the box is close, but misses to the right. Assisted by Scott Wootton with a headed pass. Attempt blocked. Scott Wootton (Leeds United) right footed shot from outside the box is blocked. Attempt missed. Charlie Taylor (Leeds United) left footed shot from the centre of the box is high and wide to the left following a corner. Substitution, Leeds United. Luke Murphy replaces Toumani Diagouraga. Corner, Leeds United. Conceded by Dael Fry. Attempt blocked. Lee Erwin (Leeds United) left footed shot from outside the box is blocked. Assisted by Toumani Diagouraga. Attempt saved. Souleymane Doukara (Leeds United) right footed shot from the right side of the box is saved in the centre of the goal. Assisted by Liam Bridcutt. Substitution, Middlesbrough. Tomas Kalas replaces Jordan Rhodes. Foul by Liam Bridcutt (Leeds United). David Nugent (Middlesbrough) wins a free kick in the defensive half. Attempt blocked. Toumani Diagouraga (Leeds United) left footed shot from the centre of the box is blocked. Second yellow card to Ben Gibson (Middlesbrough) for a bad foul. Lee Erwin (Leeds United) wins a free kick in the attacking half. Foul by Ben Gibson (Middlesbrough). Attempt missed. Souleymane Doukara (Leeds United) header from the centre of the box misses to the left. Assisted by Charlie Taylor with a cross. Liam Bridcutt (Leeds United) wins a free kick on the right wing. Foul by Grant Leadbitter (Middlesbrough). Foul by Souleymane Doukara (Leeds United). Ben Gibson (Middlesbrough) wins a free kick in the defensive half. Attempt saved. Stewart Downing (Middlesbrough) left footed shot from outside the box is saved in the bottom right corner. Assisted by Albert Adomah. Liam Cooper (Leeds United) wins a free kick in the defensive half. Foul by David Nugent (Middlesbrough). Giuseppe Bellusci (Leeds United) is shown the yellow card. Attempt missed. Jordan Rhodes (Middlesbrough) header from the centre of the box is close, but misses to the right. Assisted by Albert Adomah with a cross. Substitution, Leeds United. Lee Erwin replaces Mirco Antenucci. Attempt blocked. Souleymane Doukara (Leeds United) right footed shot from outside the box is blocked. Assisted by Lewis Cook. Ritchie de Laet (Middlesbrough) wins a free kick in the defensive half. Corner, Leeds United. Conceded by Albert Adomah. Corner, Leeds United. Conceded by Adam Clayton. Attempt blocked. Alex Mowatt (Leeds United) left footed shot from the right side of the box is blocked. Assisted by Liam Bridcutt. Hand ball by Lewis Cook (Leeds United). Corner, Middlesbrough. Conceded by Giuseppe Bellusci. Attempt saved. Jordan Rhodes (Middlesbrough) right footed shot from the centre of the box is saved in the centre of the goal. Assisted by Albert Adomah. Corner, Leeds United. Conceded by Dimitrios Konstantopoulos. Attempt saved. Souleymane Doukara (Leeds United) header from the centre of the box is saved in the bottom right corner. Assisted by Charlie Taylor. Substitution, Leeds United. Alex Mowatt replaces Stuart Dallas.